I started to notice in my 20s that when informing someone that I liked a month because of the colour, or that I didn’t like a colour because it tasted gross, I would get funny looks. The conversation ends. Perhaps I could never explain it very well. After having a similar situation pop up recently, I decided to make a post about it with a visual explanation. However, maybe its just one of those things that if you have it, you get it. If you don’t, you don’t. To keep the post shorter, I am breaking this subject up into 2 parts. This is part 1 – all about words and numbers. First to get things started, I grabbed these sentences from Live Science and WebMD. The full article by Alina Bradford, Live Science Contributor, can be found here. Full prognosis can be found here. An example of the letters/numbers and their corresponding colours. I did not choose these colours. They just are. Now, to. be. clear. When I look at a block of text I see black font on a white page. It’s not in a colourful form. If I’m halfway in my head, like when I’m typing, I can see an imaginary haze or aura of colour. The difference is when I internalize the word an image forms in my head, then there is full on colour. Think about when you read a book. You aren’t seeing the words in front of you, instead you see the images of the story playing out. Here are rudimentary examples of some some words. Overall, I would say my name is a red word. Let’s get a little more complicated. November is both a word and a month, so I technically get two different effects from the one word. The colour of the month dominates the colour of the word. 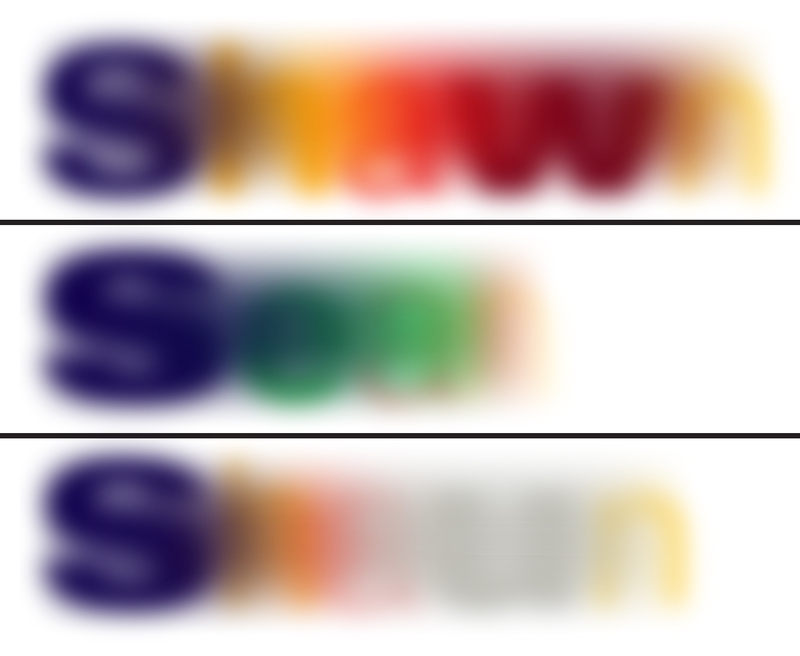 You can see that happening where the essence of the month is only golden yellow compared to the actual amount of letters that are yellow or orange. Not sure why. It just is. Overall, I would say November is a golden yellow. The spelling of a persons name make a huge difference in how I identify them an individual. 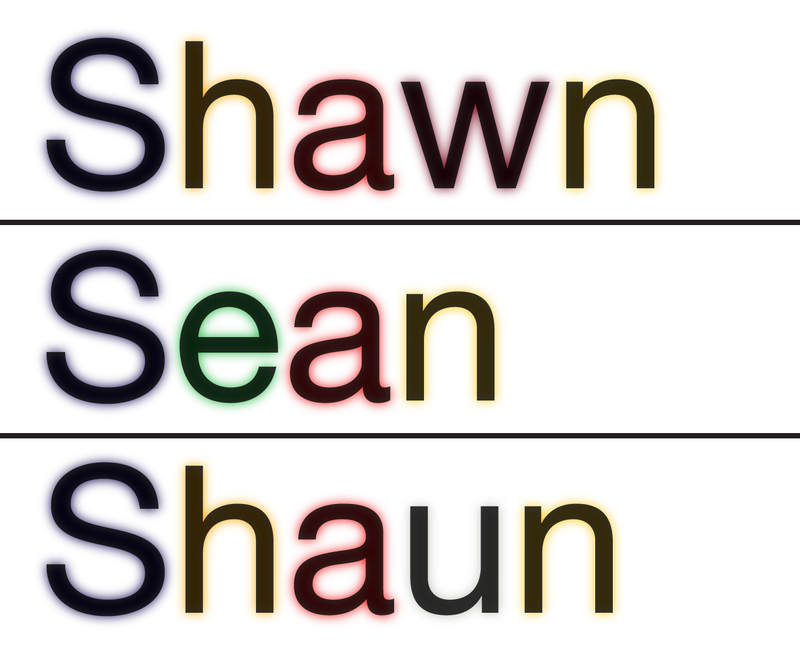 For example, you can spell Shawn/Sean/Shaun three different ways and none of them are interchangeable. Everything is shook. What the hell man! *sigh* So I need to erase EVERYTHING I know and associate with him and start all over again. The most interesting part of numbers (and my greatest frustration), was when I was in math class. The numbers I had to solve were only in black text on white paper. For some reason I couldn’t see the colours while doing math and I hated it! Well, that’s all for now. My mind is exhausted trying to dissect something that has always been there but is oddly vague. To any others with Synesthesia, is my experience similar to yours? What are the differences? Next post I will be discussing hearing and tasting colours. 4, P, R, N, H, M and # are red. 6, A, @, 9, E and F are orange. (E and F are kinda brownish) & is brownish-reddish. U, 2 and B are yellow. Q, (, ), C, 3, T, J, G, 8 and * are green. S and $ are blue. $ comes out as mostly grey though. V, Y, Z, W, K, and X are purple. 0 and D are white. I, L, 1, ., :, ;, /, and ! are black. (all pretty much the same here). + and = are hard to place. + is definitely not blue and = is somewhat reddish.
? is light green on top and black on the bottom. As for that sequence of 0s and 1s, I see opposite.